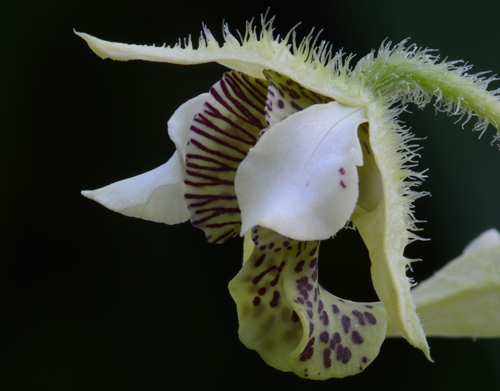 The Orchid Column: They're fuzzy. You can pet them. They're fuzzy. You can pet them. A lot of horticulturists, especially those of us at botanical gardens and zoos, despair that visitors generally prefer cute furry animals to our own awesomely cuter plants. 'They asked to see the panda and walked right past my Canna Lily!' The rest of us simply cave. 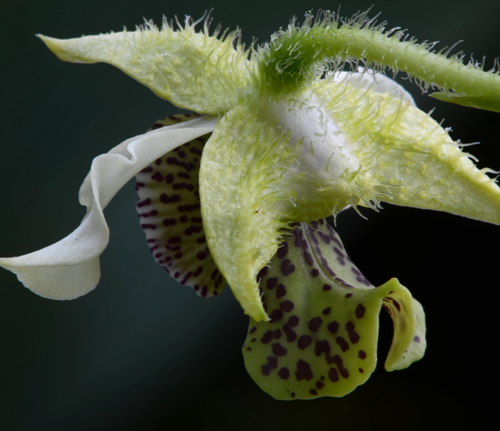 In fact, I have a hunch that most botanists and horticulturists are closet zoologists. You know the type. The plant geek who has at home a conifer arboretum, pitcher plant bogs, four rescue dogs, a cat, thirty seven tortoises and a litter of bottle-fed baby possums. And I understand completely. But allow me to make a photographic argument for the awesomeness of plants that are furry. I'm talking about plants that are hairy, tomentose, pubescent, villose or hirsute. Like Dendrobium macrophyllum with its faux fur sepals, ovary and pedicel. Dendrobium macrophyllum grows as an epiphyte from sea level to 1700 meters in New Guinea. It is widespread from Java, the Philippines, through New Guinea, the Solomon Islands, New Caledonia, Vanuatu, Fiji and Samoa. 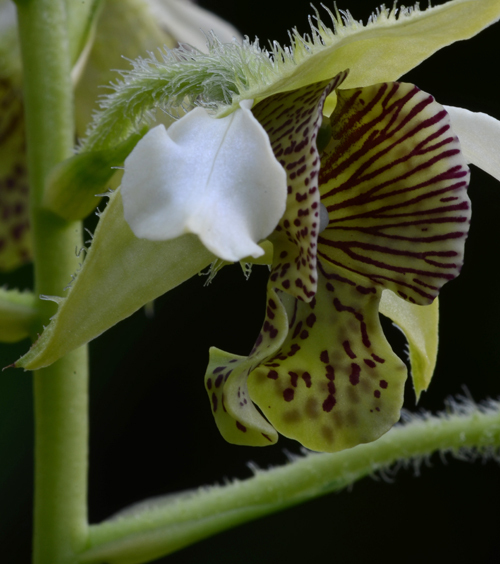 It's reported to be one of the biggest orchid epiphytes in the forest canopy. What are they for, these epidermal hairs (aka trichomes)? Hairs on leaves serve a variety of purposes --they slow water loss, reflect solar radiation (succulents), provide a layer of frost protection (Puya), are water absorbant (Tillandsia), provide chemical defense or entrapment (glandular hairs on lots of species). 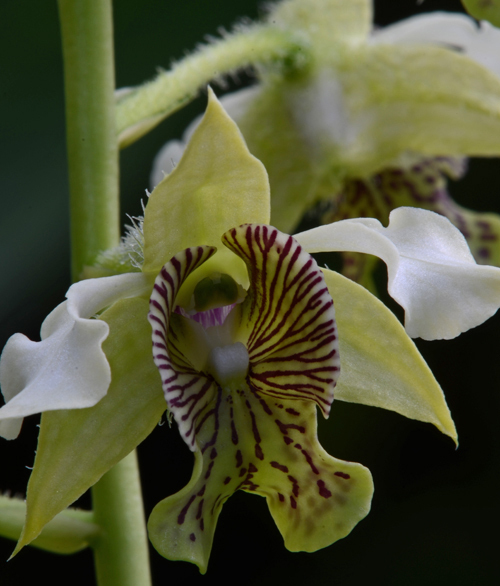 Could the hairs on the sepals of Dendrobium macrophyllum make the buds less enticing to a hungry herbivore? Maybe. 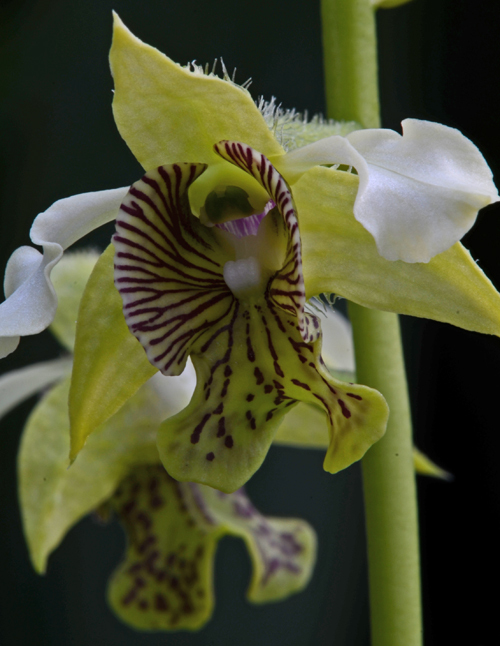 But they definitely make the orchid appealing to us.